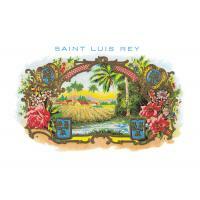 Saint Luis Rey was founded just before the Second World War. Some say that its name was taken from a Thornton Wilder play “The Bridge of San Luis Rey”, which was popular at the time. However it is more likely that it refers to the town of San Luis in the heart of the Vuelta Abajo tobacco zone, which is particularly famous for the superb wrapper leaves produced there. Whatever the truth may be, Saint Luis Rey enjoy a reputation among Habanos lovers for the intensity of their flavour throughout the range. They are made with filler and binder leaves from the Vuelta Abajo zone. All sizes are Tripa larga, Totalmente a Mano – long filler, totally hand made.